[INQ. NO. 1510M04] DAEKWANG METAL is a manufacturer specializing in bolts and dealing with various bolts, nuts, washers, other manufactured goods and CNC processed goods. This company, with its tradition of family management and now managed by the 2nd generation, along with a tradition of bolt manufacturing and wholesale business, promises to take a great leap forward and establish a solid foundation. DAEKWANG METAL has recently developed V-LOCK that prevents bolts and nuts from loosening. It has an excellent reputation for being productive, effi cient and accurate. If a special thread is formed on only either one of the bolts and nuts in combination of all threaded fasteners where vibration occurs, it is the system to prevent loosening. Threaded bolts engage two machined tangential lines in the dent of the nuts to maximize static friction force and prevent loosening. Affordable price ensured due to washers, double nuts, springs, coating process, expensive locking nuts & washers not required. 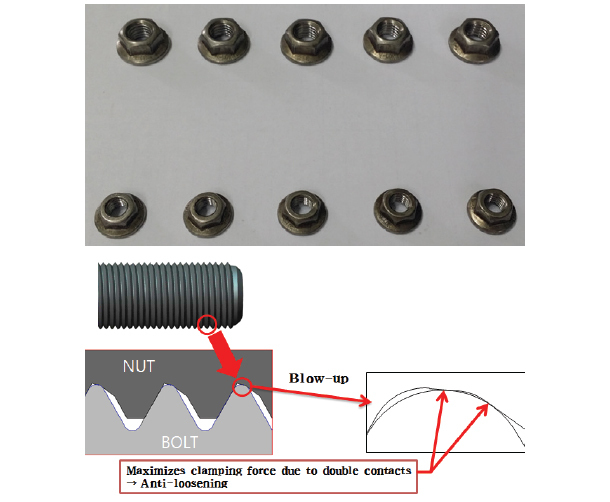 Pass of vibration tests of V-LOCK nuts is noticeable in comparison with competitor’s products. V-lock is highly recommended for difficult areas for the maintenance. It is applicable to a wide range of all industries. It is applicable to any product where threads are formed. To prevent the possible happening of loosening, only v-lock threads are only necessary without a separate coating process. Filed Under: Machinery Tagged With: Anti-loosening system, DAEKWANG METAL Co. Ltd.